Sober Look: Who pays the taxes in your neighborhood? 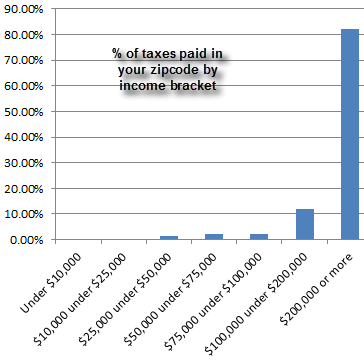 Who pays the taxes in your neighborhood? Here is an interesting exercise. Download the 2008 tax spreadsheet from the IRS website for your state to see who files returns along with amazing amount of other information - dependents, mortgages, deductions, etc. You will be able to chart who pays the taxes in your area. And the chart will probably look like this, with the highest earners (the famous 1%) paying the bulk of the taxes. Enjoy.